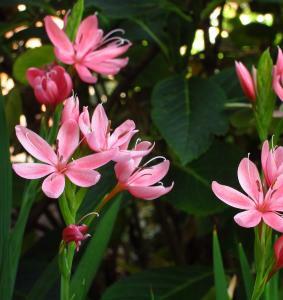 Schizostylis coccinea Fenland Daybreak is commonly known as the Kaffir Lily. This plant is a vigorous semi evergreen clump forming perennial. Has narrow erect sword like mid green leaves. The upright stems bear clusters of large open cup shaped Salmon pink flowers throughout Autumn. Prefers full sun and grows in a moderately fertile moist but 'well drained' soil. Height 0.6m by 0.3m spread.